For years, there has been confusion over the population of Muslims in the United States of America (USA). In the past, most of the estimates suggested varying figures that ranged from 2.6 million to 5 million. But other estimates suggest that the number could be well over 7 million--which is a big figure considering that the Muslims are settled mostly in urban areas in USA. Even this is estimate was made more than four years ago. The Council on American-Islamic Relations (CAIR) had estimated that there were 7 million Muslims in US. The focus on Muslim population is back after Donald Trump, who aspires to become US president, has made controversial comments, and announced that if elected, he would ban entry of Muslims in the country. Though it is not clear how he aims to achieve the objective, Trump's comments have led to an uproar across the world. Right-wing xenophobes like Trump may rouse anti-Muslim sentiments, but Islam has been a part of American culture and heritage for long. In fact, already there are tens of millions of Muslims in the country. But the statistics are not official. 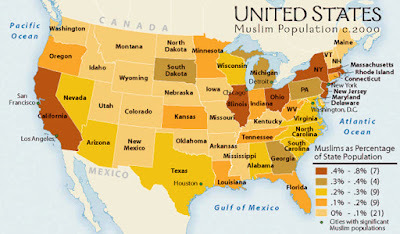 The reason for confusion over the population of Muslims in United States (US) was that the citizens' religious affiliations couldn't be asked for in census in USA, and hence, there was no accurate and official record about the size of Muslim community in America. It was believed that that the figure was between 3.3-5.7 million earlier. But, independent agencies and surveys conducted, and estimated on the basis of attendances at all the mosques, have led to the estimate. In fact, the figure may be even higher. Though Islam has been part of American culture for ages, and there has been Muslim presence in the country from the 17th century, the Muslim communities grew in size only in 20th century. 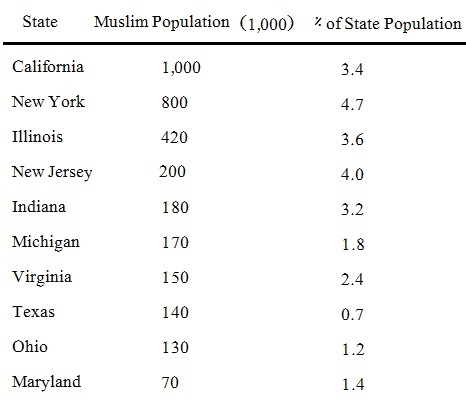 New York is estimated to have the highest Muslim population. The estimate is between 6,00,000 to 1 million [6-10 lakh]. The earliest Muslim communities were the African-Americans and the Arabs. 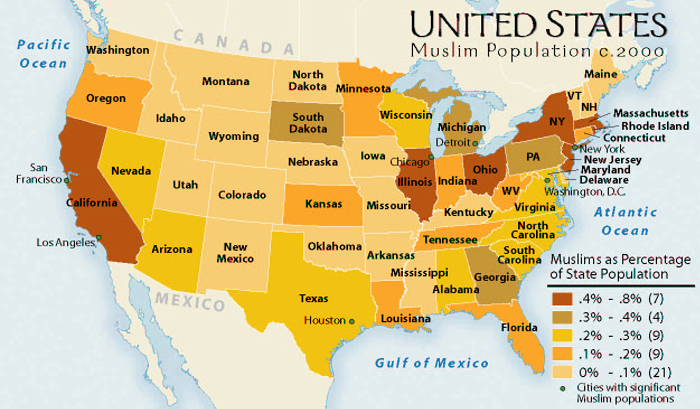 In the later part of 20th century, Muslim population in US began increasing fast. The reason has been consistent immigration from other countries. Muslims from South Asia, particularly, India-Pakistan-Bangladesh and the Middle East have been immigrating to US in large numbers. Though Muslims faced prejudices and mistrust post-9/11, yet this didn't stop Muslims from coming to America. The number of Muslims has been going up because of asylum seekers and Muslims from conflict-prone regions and war-torn countries that are being granted citizenship. The Muslim countries that got maximum green cards issued are Pakistan, Iraq, Bangladesh, Egypt, Somalia, Uzbekistan, Turkey, Morocco & Jordan. 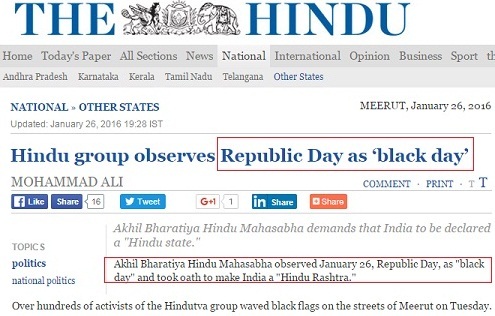 Indians celebrate Republic day but Hindu Mahasabha observe Black Day: Who is patriot, who is fake nationalist? While Indians, irrespective of their religious and political affiliations, celebrated Republic Day, there are people who observed January 26 as 'Black Day'. The ultra right-wing Hindu Mahasabha leaders took out a protest rally. 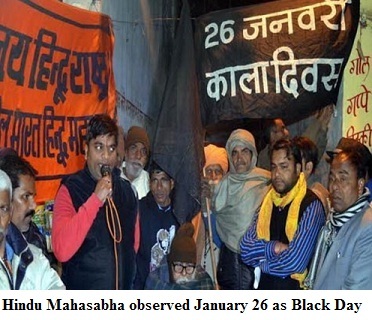 They said that they considered Gantantra Diwas as Black Day [Kaala Diwas] and raised black flags. The Mahasabha leaders said that they didn't have faith in Indian constitution. 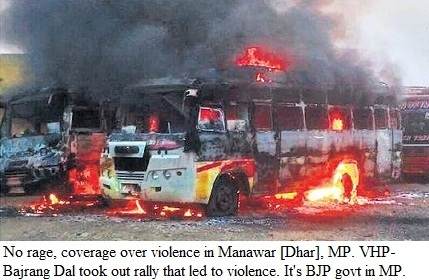 The major newspapers reported how the Mahasabha leaders held the protest in Meerut. 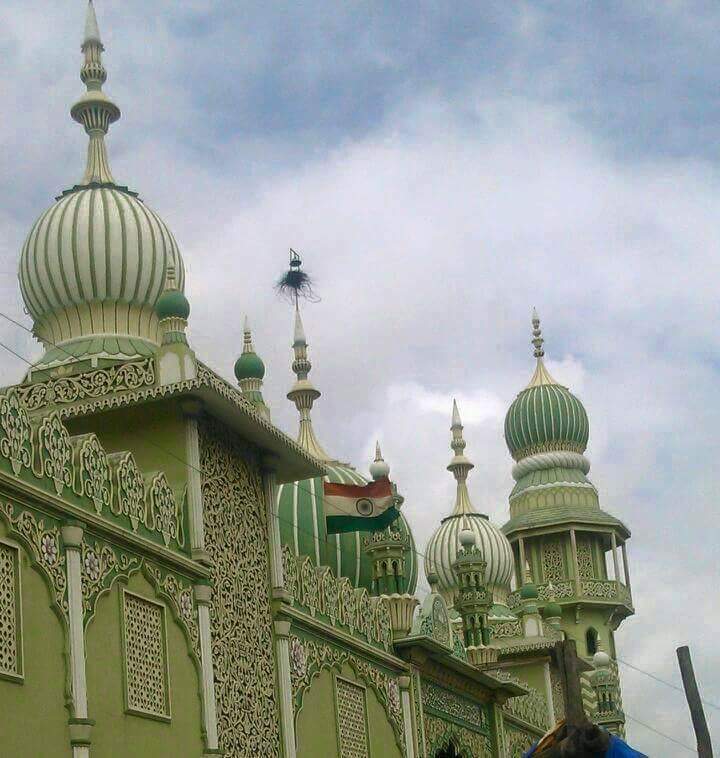 Meerut is a communally sensitive town in Western UP, which is close to Delhi. Strangely, despite the provocation, no case was registered in this regard. The policemen who are generally quite swift in filing FIR, didn't slap them with case of sedition. The Hindu Mahasabha is known to be an open supporter of right-wing extremist Nathuram Godse, who had killed Mahatma Gandhi, and was sentenced to death for the crime. The self-styled nationalist brigade readily terms others as 'anti-national. However, the truth is that Muslims who are always on target and are asked to prove patriotism, foist national flag even in Madarsas and on Mosque premises. 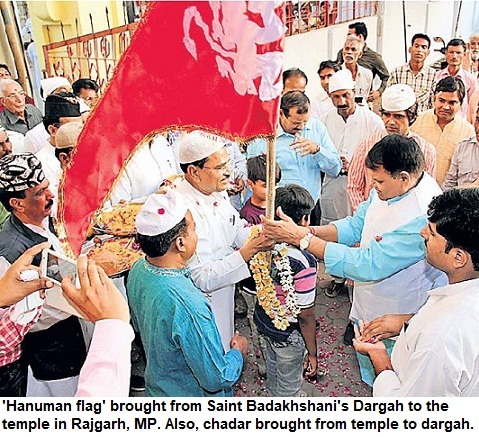 Even, on Haj pilgrimate, Indian contingents are seen holding the flag with pride. That's the love for tricolour. However, the fake nationalists are exposed as they secretly love 'Saffron flag' and it is well-known that right-wing groups avoid hoisting the national flag. First, there were fatwas against terrorism and ISIS. 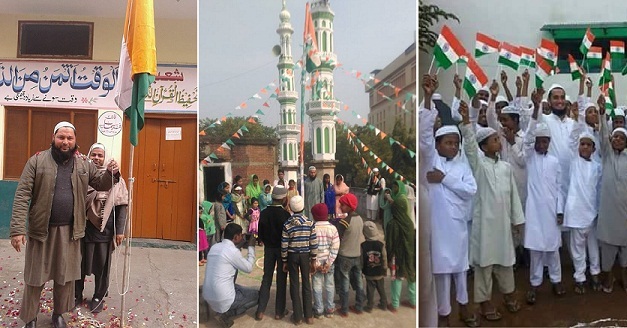 Now, Indian Muslims have taken to the streets, to raise their voice against the outfit. 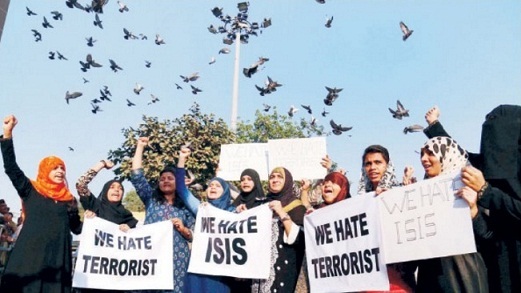 The photograph on the left, shows Muslim girls raising slogans against self-styled 'Islamic State'. This is not a lone protest. It is part of a campaign. The reason is that many Muslims now increasingly feel that just condemning ISIS is not enough, but there is need to go to the street and say it, strongly, so that the message goes out. Specially, in the wake of arrests of Muslim youths on suspicion of links with extremist groups, the Muslim community has decided to come out strongly and raise their voice. Muslims in general are disgusted by the acts of groups like 'Islamic State', which is also known as 'Daaesh', ISIS or ISIL. Also, with media reports continuously giving wide coverage to inhuman acts of ISIS, community is deeply concerned. The complexities of the situation in Syria and other countries of Middle East aren't clear to everyone. However, the manner in which ISIS has been executing people and using Islamic symbols, distorting the message of the religion, has disturbed Muslims. Earlier, over 1,000 Muslim religious heads, clerics and scholars had issued a joint fatwa, denouncing ISIS. It termed the activities of the militia is inhuman and against the teachings of Islam. A copy of the text was sent to United Nations (UNO) too. Now, a big campaign has been launched. 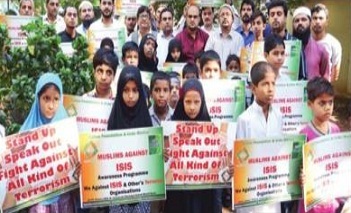 It will mostly focus in Western part of India, where there are reports of many Muslim youths getting indoctrinated and affected by ISIS' propaganda. Mumbai-based Sahas Foundation and Urdu Markaz are jointly organising the campaign. The aim is that parents also take care that the children don't get astray. A report about this campaign is published in Times of India (link below). Social media has revolutionized the news world. With more hits coming from Facebook [and Twitter], media groups are increasingly focusing on promoting their content on these sites. 'Likes', 'Shares' and 'Retweets' (RTs) are now used to gauge popularity of stories, reports and articles. Most media organisations want 'content' that does well on social media. Facebook is now considered more a platform that sends hits, rather than Twitter. 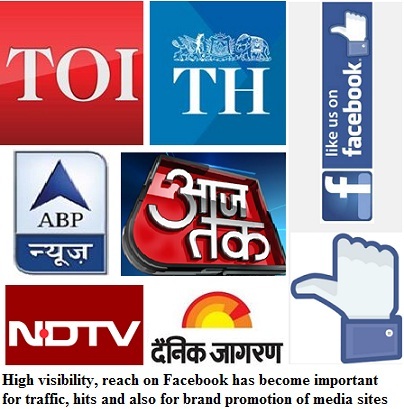 Twitter works in a different way but first, we shall look at the Facebook presence of Indian media. All those busy in making strategy for social media, talk about Clicks and Eyeballs. The clicks [hits] are obtained through smart, catchy and even sensational [misleading] headlines. Especially, Hindi media is doing it more to grab eyeballs. The major media groups that have strong presence on the ground, are doing well on the social media too. But there are exceptions too. Some papers with huge circulation, don't have strong social media presence. When you 'like' a page, you automatically become a follower and hence a consumer of its content. The more 'likes' and 'followers', a media company has on Facebook, the more is the reach of its content. And, it not only brings advertisement revenue but also increases the brand value of the company. The media groups also use different ways, even spending money to drive campaigns for more 'followers'. Times of India is the clear leader on Facebook. It has more than 79.38 lakh or 7.9 million likes [followers]. However, the surprise is that 'The Hindu', which is considered more traditional, is second in the list with 44.17 lakh or 4.4 million Facebook likes. Hindustan Times has 41.33 lakh likes which puts it at the third place. Indian Express is also catching up fast now, though it was far behind till recently. Express has nearly 35 lakh 'likes'. Deccan Chronicle follows. Among other English media, the weekly India Today has a strong following on Facebook. It posts content of dailyO as well. India Today has nearly 73 lakh or 7.3 lakh followers, which puts it among the most influential news brands on Facebook, in India. When it comes to TV channels, Aaj Tak and ABP News are the leaders. Aaj Tak is at the TOP. In fact, the two channel leads in all the segments as they are far ahead of English, Hindi and regional papers too, on Facebook. Both Aaj Tak and ABP have crossed 10 million or 1 crore figure on Facebook. It is followed by NDTV, Zee News, Times Now, IBNlive.com, India TV and IBN 7. There are many other channels too, with over a million followers on this social networking website. *The figures above will keep changing, increase, in most cases. The data is for January 24, 2016. A right-wing extremist group is creating an army of youths, who are being given arms' training openly. The youths are not only trained to use traditional weapons' but are also being taught how to use firearms viz. guns, rifles and pistols. The organisation claims that its aim is to protect Hindus. It vows to fight terrorist groups. But a parallel force that indoctrinates to such an extent that the members consider all Muslims as enemies, is surely a cause of concern for our country. Isn't it? Even more serious is the fact that children are attending these camps. These kids are being not only learning how to use weapons but are also being brain-washed. 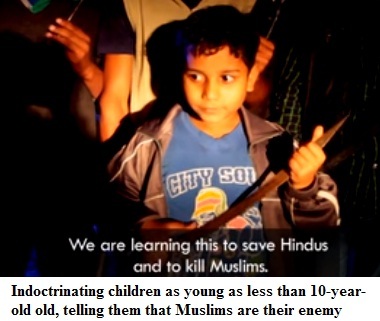 Children who are not even ten year old, are being indoctrinated. They are told that the 'Muslims are their enemy'. This is happening openly. Yet, the police haven't touched these camps as yet. Forget, intelligence officials, even the local administration seems to have turned a blind eye towards the 'extremist army'. There has been no action against the group. In fact, local Hindi media, hasn't been critical of them either. The Samajwadi Party (SP) government that is in power in Uttar Pradesh, hasn't taken any action, even after the report was released. Now, multiple channels and papers have published reports about the organisation. We fully support tough action on extremist Muslim groups and in the same way, these extremist Hindu organisations should also be dealt with. Else, things may go out of hands. Let'see if Chief Minister Akhilesh Yadav takes any action. 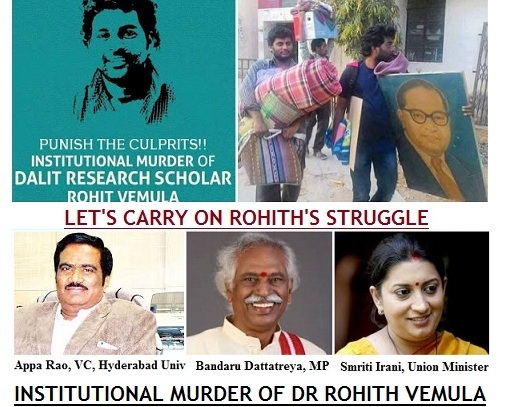 The death of Rohith Vemula has shocked the nation. Especially, the students' fraternity, is aghast. But can it stir us enough, to make all of us take up the cudgels and ensure a change in the system? That's easier said than done. Caste has killed talent for centuries in this country and our universities have been guardians of 'caste merit' for ages. Rohith's death is not the first such incident. Dalit students have been facing institutional biases in campuses across the country. The incidents in EFLU or the students' protest in Madras Law College, are just a few examples of injustice towards the Dalits. The University action was exactly in sync with the manner in which dominant castes act against the dalits, oppressed castes. The academia is no different from the rural landscape where caste atrocities are the order of the day. The five research scholars, all Dalits, were barred from entering the hostels, administration buildings and from participation in elections. They were suspended. When students from the poor families, who have work hard to reach the edifices of higher education find that there is no idealism here but the same mindset ruling these institutions of 'high learning', what they must have felt. That, there is no justice. No way to fight the 'system'. That the 'system', the 'status quo' will always prevail. In his last letter, Rohith wrote that how he felt 'empty'. One could sense, what he must have gone through. The Ambedkar Students' Association (ASA) had raised its voice against capital punishment. How can it be termed 'anti-national'. The Law Commission of India has also supported abolition of death penalty. So how come anyone against death penalty be termed 'anti-national'. But ASA had become a thorn in the flesh of the casteist edifice of the central university. 1. Please serve 10mg Sodium Azide to all the Dalit students at the time of admission. With direction to use when they feel like reading Ambedkar. 2.Supply a nice rope to the rooms of all Dalit students from your companion, the great Chief Warden. The ABVP, which is the students' body linked to Sangh Parivar, was against the ASA stand. The ABVP had the support of the University administration. False accusations were made against ASA office-bearers. A committee, however, found that the allegations were untrue. Still, ABVP got local MP to write a letter to Smriti Z Irani, the Union minister. The VC quickly took action against the research scholars, who were suspended. Even, the stipends were stopped. The research scholars were expelled from the hostel and were staying in the open. The row had began in July. But for months, the Hyderabad University [Central University] sat over it, refusing to resolve issue, which ultimately led to Rohith ending his life. The vice-chancellor Appa Rao acted in a partisan manner. BJP MP Bandaru Dattatreya wrote to Smriti Irani, about 'anti-national activities' on campus. After this letter, the administration came out vengefully against the research scholars. And, the rest is known to everybody. Do read the links to understand the turn of events which led to the death. A protest turned violent in Malda leading to arson and injuries to some persons including policemen. Fortunately, there was not a single death. Any sane person would condemn the violence. However, Malda violence has been blown up as a big security challenge for the nation--by section of media and BJP leaders. In a country where people taking to streets and resorting to violence is a such a common practice, it was clear that rage was being manufactured on social media, as well as on the ground. The mob targeted the police station but it DID NOT EVEN TOUCH THE TEMPLE on the premises of the police station, reports BBC correspondent Ravi Prakash who went to Maldah to cover it, later. It was not a Hindu-Muslim issue. In fact, media kept reporting, wrongly, that there were 2.5 lakh protesters. It was nothing but hyperbole, lies and exaggeration. Where did this figure come from and how could lakhs gather in this small town for such a protest? Malda city has barely 20,000 odd Muslim males and even if all of them came to protest, just imagine the extreme exaggeration, how they floated a figure of 2.5 lakh. Malda is a Muslim majority district but the city has Hindu majority, with nearly 1.5 lakh population and around 45,000 being Muslims--half of them males. Assuming all males, except kids, reached, it would barely make 20,000. The number of people who were part of the protest was barely a few thousand. Editorials were written, TV channels were discussing Malda in prime time and BJP sent its delegation there. The scale of violence was nothing at all, compared to recent Patel agitation in Gujarat, where property worth hundreds of crores was burnt. In Gujarat, nearly six persons died, and there was lawlessness in entire state. Gurjar agitation is not something of distant past. In fact, it is unfortunate but people setting up vehicles and even police stations afire, is not uncommon in this country. After Malda, right-wing groups organised 'Shaurya Diwas' in Madhya Pradesh, and there was arson, attacks, burning of shops, but THERE IS NO RAGE now. Why? There are reasons why there won't be rage in any other such incident. Aim is to defame Mamata government! For almost two years, there is a systematic attempt to DEFAME Mamata government, to paint Bangladesh as a land where 'Jihadis' [read Muslims] are flexing muscles, to somehow create communal tension--ahead of elections. The manner in which Malda was made the single most important issue in the country, shows how the right-wing lobby is targeting TMC [Mamata Bannerji-ruled WB]. It is not very difficult in this era, when channels are crazy and going to any extent for TRPs, even turning a few thousands into LAKHS. How rage is manufactured! It needs organised people to run campaigns. There is a huge machinery in place doing it. Tens of thousands of ideologically like-minded people on Twitter and Facebook, began talking about Malda. This huge cyber army is now capable of making any non-issue into an issue. Not just the 'paid cyber army' but also the right-wing supporters, who number in thousands (may be even more), are suddenly in action, when there is any such incident. And, who bothers about facts and figures, when there is hysteria. This is exactly how Burdwan case was blown up for months, it was made the single most important issue in India. Remember, NSA's visit to Burdwan, and how it was used to tarnish Mamta Banerji government! Of course, once BJP fails to win the election, Project Bengal will be over. There won't be focus on incidents in Bengal. The next state would be targeted. Perhaps, UP or some other state. That's the harsh reality. 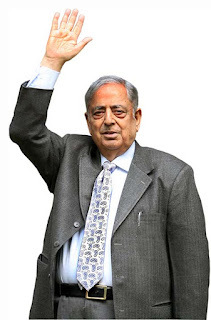 Veteran politician Mufti Mohammad Sayeed, who was chief minister of Jammu & Kashmir, has passed away in Delhi. Mufti, 80, was undoubtedly a master politician, who will always be remembered as the first Muslim home minister of India. Once it was commonly said that no Muslim could ever be made a Home Minister in India as the ministry directly heads intelligence agencies apart from handling 'sensitive information'. But when the National Front government under VP Singh came to power, Mufti became India's first Muslim Home Minister. It was big news in media for days. However, his tenure was anything but memorable. Soon after he became Union home minister, his daughter Rubaiya was abducted by militants in J-K. It became a crisis for the state government as well as the Centre. Rubaiyya was finally secured and safely recovered (after militants were released), after long negotiations. But that was not the end of Mufti, who is credited to set up a political party in Jammu and Kashmir. This was no mean job. To establish a party in the state, where locals claim that nothing takes place without Centre's nod, and to become chief minister, that too twice, is a remarkable achievement. Mufti's daughter Mahbooba Mufti also matured as a politician. In a state where Sheikh Abdullah's National Conference was the major party apart from Congress, Mufti's PDP surprisingly managed to create its vote. Many Kashmiris now blame Mufti for letting the BJP [and the RSS] spread their base and power in Kashmir. If politics is the art of impossible, Mufti definitely did the impossible. Despite the contradictions, Mufti and Modi came together. He formed the government with BJP, the first time the Saffron party came to power [even though in an alliance] in the state. Also, RSS began holding 'path-sanchalan' in the State. This was something new in the State and many locals resented it. Many Kashmiris feel that Mufti's regime weakened the state's special status. The issue of state flag also came to fore during his second tenure. However, to many outsiders Mufti's seemed better than Omar Abdullah's term when 'stone pelting returned with bullets' led to more than 100 youths killed.